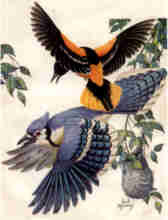 Point Pelee, located on the north shore of Lake Erie in Ontario, Canada is one of the best birding spots on the continent in the spring. This 7-mile long peninsula attracts astonishing numbers of migrating songbirds, including the colorful warblers. For the weekend trip, we'll spend most of our time on Saturday and Sunday in Point Pelee National Park, a scenic park that attracts birders almost as much as it attracts birds! The ambience of the park - its woodlands and wetlands, beaches along Lake Erie, dunes, boardwalks, and well maintained trails and tram system, make for a memorable experience. In addition to birds you can expect excellent wildflowers, as well as potentially a great variety of butterflies. Expect early mornings, and the opportunity to bird well into the evening on Saturday (breaking for lunch and dinner, of course) as we seek woodcock in the dimming light of day. Your leaders are Steven Daniel and Douglas Bassett. 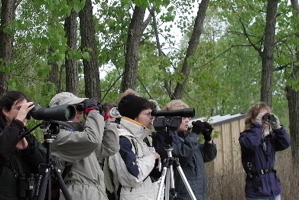 Experienced naturalists and birders, they have been leading groups to Pelee since 1982, and have spent countless hours enjoying and sharing the Pelee experience. Participants are responsible for: transportation to Point Pelee (approximately a 6-hour drive from Rochester), meals (rooms have kitchenettes - bring your own breakfast and bag lunches), and park entrance fee. A slide preview, orientation, and more detailed information will be given participants at a pretrip meeting which will be held a few weeks before the trip. Specific place and time will be mailed to registrants. Other trip information will be mailed to anyone not able to attend the meeting.